I was looking for a certain particular pair of shoes i needed for work that i saw online and wondered if they had them in store. I looked around the whole store and couldnt find them so a lovely lady went to the back for me and found them. All staff are polite and friendly. Store clean and tidy.Pleased to find what I wanted.Staff at till friendly and efficient. My friend and I visited the store to exchange my friends boots. She bought them a few weeks ago and noticed a rather strange unpleasant fishy smell coming from the boots. She googled it and found out that sometimes leather can have a fishy smell. However, it put my friend off wearing the boots as people were commenting on the smell. So we went in to the derby store and decided to smell another pair of the same boots and unfortunately, they were the same. 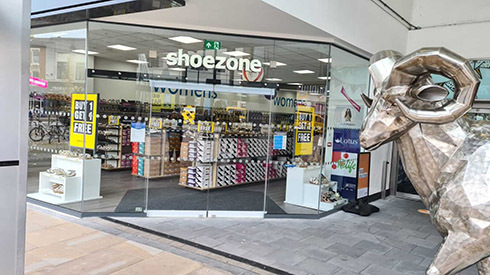 My friend chose some other boots and approached the woman (Julie) on the till to explain the strange situation and ask if it was possible to get an exchange. Julie was rather rude, she wasn't friendly and welcoming and just wandered off to another member of staff once we had explained the situation. My friend was apologetic, even though she had no reason to be. Julie came back with another member of staff (a blonde lady) who was extremely rude and kept making the comment "these are our top sellers this year and last year and we have NEVER had any problems with them before". They were both rude and dealt with the exchange disgustingly. I made the comment that the other boots in the shop smelt also, so it wasn't just this particular pair. I have worked in retail myself for the last six years and the treatment we received was appalling. I would never deal with customers in the way they did and think they may need some training in customer care! A smile and manners have never hurt anyone.